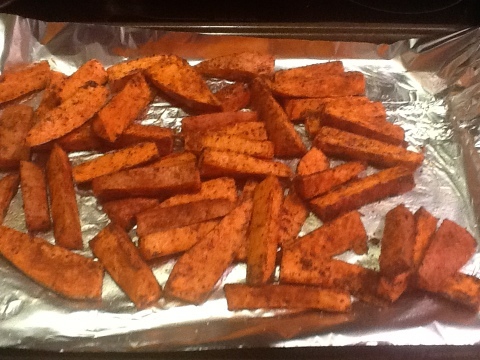 Tonight I made these Sweet Potato Fries. I used only 1 tbsp of olive oil instead of 2, and only half a teaspoon of salt instead of two teaspoons. They looked delicious, they smelled delicious, and I think they would be delicious if I hadn’t put so much cayenne pepper in the mix! ay-yay-yay. I had not used cayenne pepper that much in recipes, and so I thought I’d go with the whole half a teaspoon. For most people this might be fine, but for me, it is *too* much. My mouth is burning. So, it was hard for me to taste the other delicious seasonings-which are some of my favorites. And I burnt the pork chops, so I had to do plan b on those, and made Market Day Naked Chicken Cordon Bleu. It’s actually not bad for a pre-made chicken, but it’s not what I had in mind. 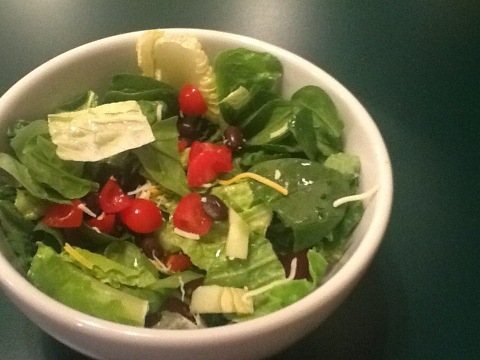 The savior to the meal was the salad which I chopped the tomato and cucumber really small (I love when restaurants do that) and added black beans and a pinch of cheddar cheese. So, I ate the potatoes and the salad, and I am waiting for the chicken. Does anybody have good sweet potato recipes? I love them so much and am always looking for good ways to use them. Also, guess what I did yesterday, besides grade my face off? I got all of my magazine recipes in page protectors in one binder!! Now, I just have to organize them in categories. But, just having them not sticking out everywhere and easier to leaf through has relieved some of that stress. 2 Responses to Cayenne Pepper is Hot. I have totally done that before. My wife and I love sweet potato fries and have them all the time, but if you add too much cayenne, you literally want to eat them but can’t! Here’s one of my favorite things to do with sweet potatoes during warmer months: I wrap a sweet potato in a paper towel and poke it a few times with a fork, then microwave it for 10 minutes until it is fully cooked. Then, I let it cool for a couple of minutes. Meanwhile, I fire up the gas grill outside. I cut the sweet potato into 3/4 inch discs, spray them on both sides with pan spray, season them with sea salt and fresh cracked black pepper, then put them on the grill to mark them. Flip them over so both sides get a good char, then take them off the fire. These are great not only because of the great grilled sweet potato flavor — the sugars carmelize really well — but because structurally you can do so much with them on a plate: shingle them, stack them, pile chicken breasts or a steak on top of them. A lot of versatility, not to mention great orange and black color. Anyway, thanks for making me laugh today. Hope your holidays were good! Happy 2012! Those sweet potatoes on the grill sound delicious. I am a sucker for almost anything on the grill. I am a terrible grill-er. I need to experiment more this summer on the grill! Thanks for sharing your recipe. I am going to save it in my recipe file on my computer.